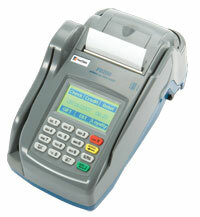 The First Data™ FD200 terminal virtually eliminates the need to use several devices to process different forms of payment. Through Wi-Fi (optional), Internet protocol (IP) or dial-up communications, it quickly and securely processes transactions. It features an advanced, built-in check reader/imager to support the TeleCheck® ECA® and lockbox services, including warranty and verification options. Both TeleCheck services help reduce the risk of accepting paper checks and save time by eliminating the need to physically take checks to the bank for deposit and processing. Such services also help protect consumers' personal information, as their check is returned to them at the POS.